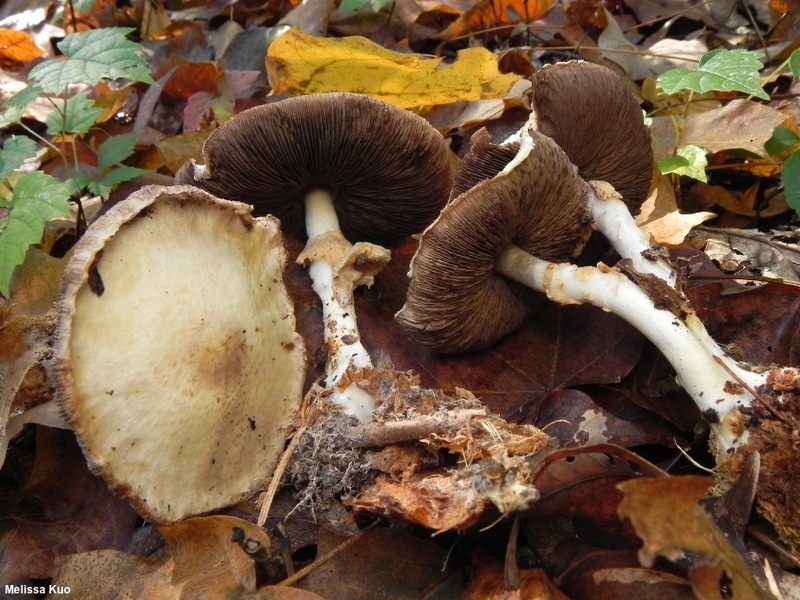 Following Kerrigan (2016), Agaricus abruptibulbus is a whitish, almond-scented, woodland species of Agaricus, separated from similar species by its slightly larger spores and the tendency of its cap to become a little yellowish with age. It features a bulbous stem base, a yellowish ring on the stem, and surfaces that turn yellow with KOH. 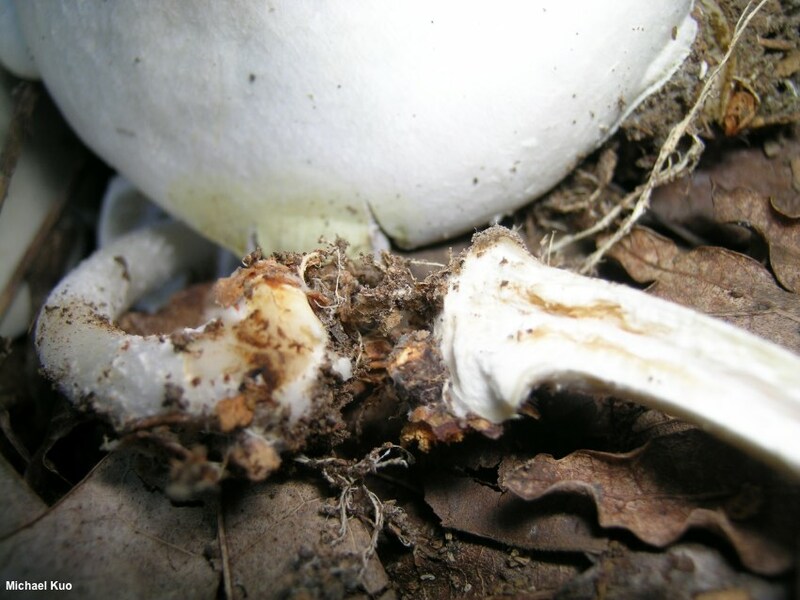 Two species with smaller spores are very similar: Agaricus reducibulbus and Agaricus sylvicola—the former with a rimmed bulb, the latter usually (but not always) without a bulb. Neither of these look-alikes turns consistently yellowish with old age. 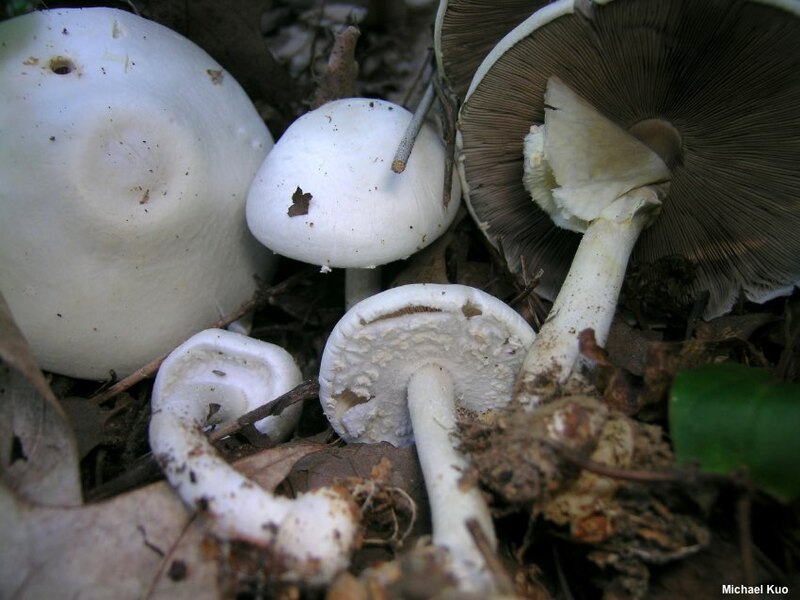 Historically, "Agaricus abruptibulbus" is a hot mess, beginning with the original author of the species, Charles Peck (1892, 1900, 1905), who conflated three separate species in his concept and in his type collection, according to Kerrigan. In the years since the name has been applied inconsistently, and sometimes subordinated to synonymy with Agaricus sylvicola (Kerrigan himself did this in his 1986 treatment of the genus in California). But DNA sequencing and micromorphology have clarified things somewhat—at least, for the time being. Ecology: Saprobic; growing gregariously in hardwood forests or in urban locations under ornamental Norway spruce; fall; documented by Kerrigan (2016) from Pennsylvania, New York, and Washington. The illustrated and described collections are from Illinois. Cap: 5–9 cm; convex to bell-shaped or a little blocky at first, becoming broadly convex or nearly flat; dry; minutely radially fibrillose or nearly bald; white when young, becoming yellowish with age; the margin not lined, yellowing slightly when rubbed repeatedly. 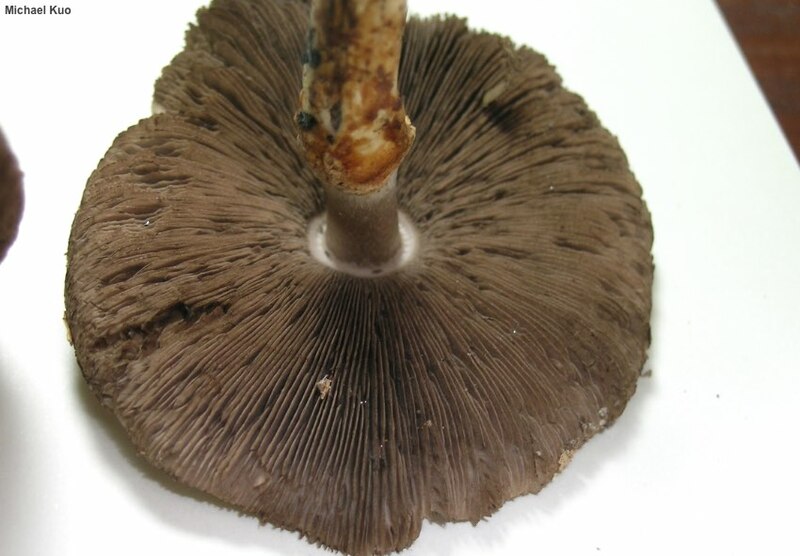 Gills: Free from the stem; crowded; short-gills frequent; white when young, becoming grayish and eventually dark brown; when in the button stage covered with a whitish partial veil that develops yellowish stains. 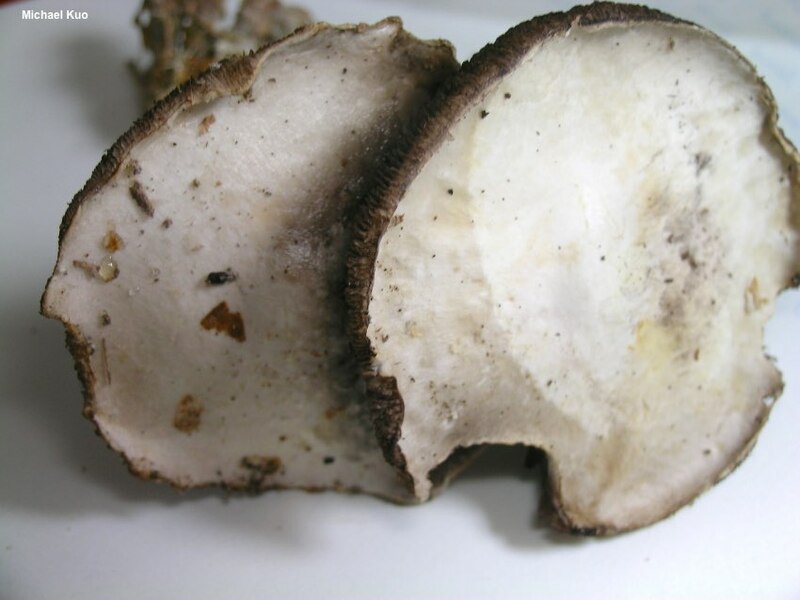 Stem: 5–10 cm long; 0.5–1 cm thick; equal above an abruptly bulbous base; bald; with a white to yellowish ring; whitish; bruising yellowish toward the base when rubbed; basal mycelium white. Dried Specimens: Cap and stem dull orangish yellow. 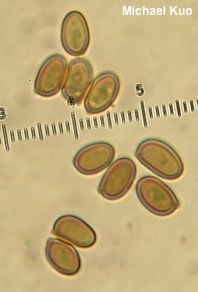 Microscopic Features: Spores: 6–7 x 3.5–4.5 µm; ellipsoid; smooth; thick-walled; brown in KOH; brown in Melzer's. Basidia 4-sterigmate. Cheilocystidia 20–35 x 4–7 µm; mutliseptate and catenulate; terminal elements subglobose to clavate or obpyriform; smooth; thin-walled; hyaline in KOH; soon collapsing. Pleurocystidia not found. 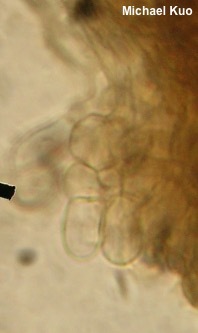 Pileipellis a cutis; elements 2.5–5 µm wide, smooth, hyaline in KOH. REFERENCES: Peck, 1905. (Kauffman, 1918; McKnight & McKnight, 1987; Lincoff, 1992; Horn, Kay & Abel, 1993; Roody, 2003; McNeil, 2006; Kerrigan, 2016.) Herb. Kuo 09030502, 10191301.